Damn. Stepping into the lobby of the less-than-a-year-old Sofitel SO Bangkok in Thailand, I immediately wished I’d booked more than a single night. Not that the three previous nights at the Metropolitan by COMO were lacking in anything (indeed, a fine hotel), but it was clear that this was something special. It was not just the expansive space, accordion-like slat ceiling, floor-to-ceiling windows overlooking Lumpini Park, suspended tribble-esque lighting, and plush furnishings that kept my head a-swivel, but the sum total effect of Christian Lacroix’s design that somehow excites as much as it relaxes. Even the purple house cocktail served to incoming guests during registration had style, as did the servers and all employees of the hotel, each dressed in one of 15 colorful catwalk-ready designs also by Lecroix. But style is not just not just worn on the public face of the hotel. 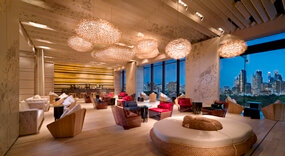 In fact, at the 30-story Sofitel So Bangkok, it gets even better in the private spaces. The 238 bedrooms themselves are ingeniously designed on four elements drawn from the essence of the city — water, earth, wood, and metal. The fifth element — fire — is reserved for the flames of the kitchens in the hotel’s dining facilities. Perhaps sensing my Vermont background, I was given wood. 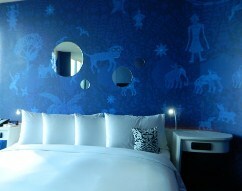 Opening the door to room 2007, I was immediately delighted by Thai architect and artist Nithi Sthapitanonda‘s redesign on the standard hotel room. Yes, the bathroom was immediately to the left and main bed area beyond as usual, but the treatment seemed novel. It was tempting to linger more in the bathroom than the main area. The freestanding tub was smooth, like a scooped out bar of soap and skirted by a slat-wood wall, Amazingly, it was able to accommodate my six-foot-one, 230-lb frame—a rare treat indeed. Add in a range of YTSARA shampoos, soaps, and lotions, and you’ve got an evening. The only thing missing might be a bottle of wine, but even that was left for me, along with a tray of delicious sweets, on the far side of the bed area. After a long soak in the tub, the bed had a lot to live up to. Happily, the Serta mattress, 400 thread-count Yves Delorme cotton percale linens, and Pacific Coast Feather Company pillows were up to the task. It’s also a great spot to explore the many technical bells and whistles of the room, including a 40” LCD flatscreen TV, Apple Mac Mini multimedia entertainment center, and illy espresso machine with complimentary coffee capsules. If you prefer to keep to the organic aspects, simply admire the creams, silks, and woods throughout the room or just stare out the floor-to-ceiling windows to the park below. Much of the non-room fun at Sofitel SO Bangkok takes place on the 10th and 11th floors, where the SO Spa shares space with the SO Fit fitness centre and the infinity swimming pool. Perched on the edge of the building, there’s almost a sensation of swimming in midair. At night, the poolside vibe turns decidedly sexier as underwater LED lights create and recreate color in tones of blue and purple. No doubt, it’s one of the best places in Bangkok to steal a kiss. The So Spa also attempts to transport you to a more ethereal plane. Based on the legendary Himmapan Forest, said to be located in the Himalaya Mountains, the spa features seven treatment rooms all linked to the range’s seven large ponds. If you’re a member of the hotel’s signature club, you get a complimentary 30-minute foot massage (which was great). Otherwise, just choose from French-Thai treatments like the signature “Serenity of Five Elements,” which includes 90 minutes of oil massages and herbal compresses. The hotel’s fifth element, fire, is employed in the kitchens. Although I was not able to dine in the hotel personally, there is no shortage of options. The showcase is Red Oven with its open kitchen managed by award-winning executive chef Nicolas Vienne. The market-style restaurant features nine live cooking stations showcasing cuisines from around the world. For nightlife, head up to Park Society on the 29th floor for some drinks on the open-air patio or inside, in a futuristic blend of stainless steel, infinity mirrors, and intersecting polygons. In a way, it’s almost not worth checking into Sofitel SO Bangkok if staying just one night. It’s just too damn frustrating to get a taste of the truly delightful hotel and not have the chance to savor it. Far better to book several nights and simply move to a new element each night. But ultimately, what makes me want to stay longer, and sets this hotel ahead of almost every other hotel I’ve stayed at, is its ability to make the leap from the physical to the metaphysical. You leave not just with a sense of rest or comfort, but a sense of experience. 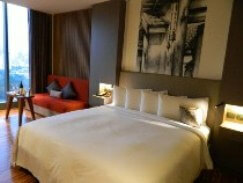 Compare rates and book online at Priceline, Agoda.com, or Hotels.com. Main photo by Mike Dunphy.